​To paraphrase Drake (which is, incidentally, how EVERY article should start), nothing has been the same since Jose Mourinho left Inter for Real Madrid, in a puddle of his own tears, immediately after his 2010 Champions League success. This Drake-ean proclamation can be applied to both the club and the man. Since that unprecedented treble eight years ago, the Nerazzurri have finished in the Champions League places just twice - in 2010/11 and 2017/18. Sandwiched in between those two exceptions are a plethora of middling to embarrassing seasons, which collate to an average position of 6.5th. In that same period, the veneer has also come off Jose himself. Indeed, it is widely acknowledged that his ensuing role at ​Madrid was the prime culprit for this subsequent malaise. Despite collecting 100 points with Los Blancos in 2011/12, his tenure at the Spanish capital was maligned with controversy and public fall-outs with high profile players. Within the machinery of such a giant club, his 'Special One' persona wore thin. Though the resurgence at Chelsea showed his persisting penchant for hastily building teams to win titles, it once again highlighted the pitfalls of his abrasive personality and short-term vision, and ended in unbridled acrimony. With just a League Cup and Europa League title to his name at ​Manchester United, he has not been able to paper over the controversy-cracks with genuine silverware like he has previously. The defeats to Brighton and ​Tottenham at the start of this season hit on all of the familiar beats of the infamous third seasons of Mourinho's past. Despite the rejuvenation of sorts against a shrinking Burnley side, and the strangely effective charm offensive after, it still seems a matter of when rather than if Mr RESPECT x3's time in Manchester will be up. Once Mr Woodward finally thinks enough is enough, and duly performs a less impassioned impression of George's termination of Lenny in 'Of Mice and Men', then a sliding doors moment of opportunity could crop up at both of those sleeping European giants. Lets now enter this newly conceived footballing utopia. It's December 5 2018. Mourinho is forlornly packing up his bags at the Lowry Hotel, having just been nudged off the cliff following an ignominious 3-0 home to defeat to Arsenal. To add insult to injury, Woodward even let a gleeful Arsene Wenger - who was spotted in the crowd - deliver the fatal blow. After slowly plucking all the darts from his ravaged posters of Ed Woodward and Paul Pogba, Mou trudges to the elevator and is about to press the calling button, before Zinedine Zidane emerges with a ding from the incoming lift - shades on, Presidential suite key card in hand. The antithesis to Mou in so many ways, the three-peat ​Champions League winning manager is nowhere near as tactically taxing as his predecessor. As opposed to ostracising stars, Zizou uses his expertise at balancing the egos of a star-studded dressing room to drag the Red Devils from the doldrums of obscurity to European challengers once more. His unrivalled capacity to both show and tell players what to do on the pitch is a breath of fresh air, pushing the previously undermined Anthony Martial and Paul Pogba to hit new heights. Out with the siege mentality and combustive relationships, in with a fortified group morale and liberated playing style. On the same day, over in Milan, ​Inter are facing a daunting situation. After another summer of promise was dampened by a start that encapsulated all their recent mediocrity, Luciano Spalletti is teetering on the edge of extermination. They've just had back to back defeats to Spurs and Roma, and are three days away from travelling to the ​Juventus Stadium for what will already be one of their last chances to wrestle their way back into the title race. Suddenly, word emerges that Mourinho's been whacked. Memories come flooding back in the board room, and then get contrasted with their current mire. Sure, they muse, Spalletti is a highly capable manager, but he's twice been given an extensive financial leash, to no avail. Paralleling the last two summers with that infamous haul of 2009/10 - where Diego Milito, Samuel Eto'o, Wesley Sneijder, Thiago Motta, Lucio and Goran Pandev were all brought in for a total £74m - and Spalletti's fate is sealed. The return of the Mou materialises. Thankfully, Mourinho is as eager as his recruiters. In the dying days of his Madrid career, he admitted: “I want to be where people love me." Upon his arrival at Chelsea, he then declared himself the "happy one". Reminiscing on this sequence of events on his way to Malpensa Airport, he acknowledges that San Siro is feasibly now the only place where this could be replicated. However, this isn't just a retreat to rosier times, far from it. In fact, some argue (though he naturally dismisses this, siege mentality and all that) that Inter's squad in 2018 is even more ripe for his callous hands to mould than the one he inherited in 2009. After all, the central defenders are all of a higher quality to anything on offer at Carrington, Ivan Perisic has been the apple of his eye for some time now and in Radja Nainggolan and Mauro Icardi there is the potential for a Sneijder-Milito-esque relationship. As opposed to in England, where the melodramatics grew weary with over-exposure, they're received with open arms and two kisses in Italy. Even more beneficially, although ​Serie A has improved dramatically in recent times, it is still yet to be totally consumed by the high-press, ball retention focussed styles that have become ubiquitous in the ​Premier League. The more ponderous, pressure absorbent ways of Mourinho are therefore far more appreciated, and far more successful. Though the Champions League obviously alludes him initially - United have guaranteed that piece of silverware for the next three years at least by bringing in Zidane, remember - a Scudetto is garnered in 2019, thanks in large part to Ronaldo's explosive exit from Turin, after winning the Treble without scoring one goal in any competition. In any case, with both teams firmly re-established in the upper echelons of the sport once more, I can happily report that all is right in the world. 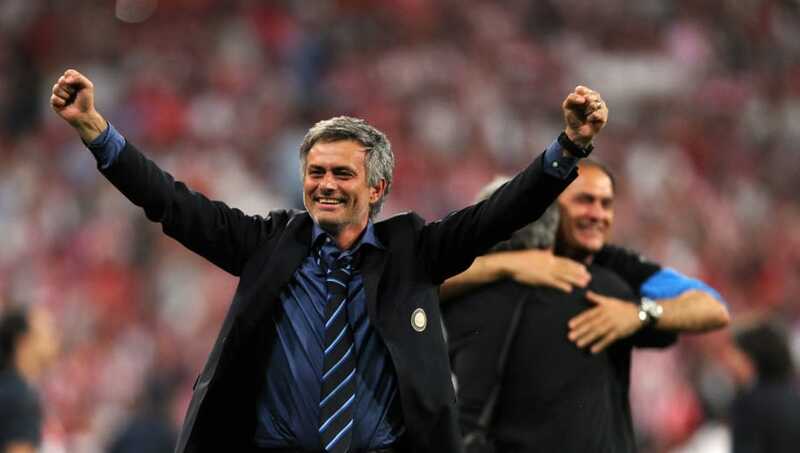 Oh, and for the record, Mourinho does become Italian President in May 2023, but that's another story entirely.